Ever since I switched from Windows to Mac over 9 months ago I've been obsessed with making myself as productive as possible in OS X. 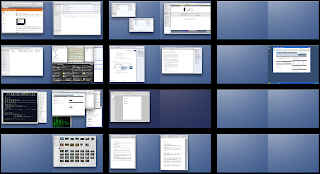 Without question one of my favorite features is Spaces, the multi-desktop feature for Leopard. Here is how I've set up my environment to make the most out of it. My primary workstation is a Mac Pro with 12GB of RAM and several TB of disk space. In addition I have two monitors attached (Samsung SyncMaster 204B), which gives me an effective 3200x1200 of desktop real estate. In my opinion you can't have too much RAM, disk space or more importantly screen real estate. The other thing that I've found extremely helpful for me was using a decent multi-button mouse. In my case I'm using the one from my older Windows XP gaming rig, a Logitech MX 510 Optical Gaming Mouse . The best part of it for me is that I've set the additional button below the mouse wheel to activate Spaces, making it really easy to quickly access the list of windows and select something. Since the Logitech drivers are buggy I purchased a license for Steermouse, which gives me all of the mapping functionality I need to map buttons in OS X.
I use Spaces by breaking my windows up into work areas for specific classes of tasks. In this way when I am in that work area most of what I need is visible. In some cases I want minimal distraction and in others I use the Space as a view into one of many conduits of information. My primary web browser is Firefox and NetNewsWire is my news reader. I'll have multiple tabs open in my browser and use it when I'm doing research or catching up on the day's news. This is one of those distraction zones and I try to be regimented about how much of my time I spend here. Since I sync up my iPhone frequently and often like to have music playing in the background, iTunes gets it's own Space. I rarely spend any time in this particular space. I try to keep all of my direct incoming and outgoing communications in one place and that's what this rather crowded Space does for me. I run the standard Mac Mail.app in the left monitor and in the right I have Adium, Skype and TweetDeck active. I also have a small TextEdit window open where I jot down notes and thoughts. I just started using TweetDeck today but have already become quite attached to it. Great way to stay on top of my expanding Twitter feed. I always seem to be referencing PDF documentation on a regular basis. Today I've got a PayPal API document and an Active Merchant tutorial I am going through. Since these two are going hand in hand for what I'm working on I have them both up. Normally I have a single PDF up in this space; I'll mute the speakers, shut off my Growl notifications and music and focus on reading. It's a bit like entering a library to me. Though I rarely use it any longer I tend to keep a Windows XP instance up and running in a VMware Fusion virtual machine. My primary need for it now is to load up Internet Explorer and check how the web based application I am building looks on it. Lately this is where I've been spending most of my time as I get ready to launch my next business. I've been doing the work in Ruby on Rails and as a result keep a couple of different windows up and running in here. On the left monitor I have TextMate up as my editor of choice. In the right monitor I have a standard OS X Terminal window up with several tabs inside of it. A background tab has my active Mongrel instance running the development version of my application and the foreground tab is ready to accept commands. I use Safari as my web browser for local application testing and may have several tabs for documentation open in it as well. Since I use MySql as my primary database I keep a MySql Query Browser handy with my development database loaded in case I want to make quick changes to the data set. This is rounded out with a TextEdit window that contains a list of issues and notes for what I am working on. This Space is reserved for OmniGraffle Pro. Since it has lots of additional windows and pallets I tend to let it take over both monitors. I use OmniGraffle for mocking up wire-frames of my application pages and working through flow charts for application logic. Though I don't keep it open all the time I do have a dedicated space for iPhoto, mainly because I let it take over one monitor while I have Finder windows open in the other if I am moving pictures to different media for transfer or import. I'll also do my editing with Gimp in that Space. I've become quite fond of Pages because of it's simplicity and have a Space dedicated to the times when I am in letter writing "mode" or creating marketing materials. As you can see I also maintain a few open Spaces that I can jump to if I have some application or task that falls outside of my pre-defined areas. The benefit to all of this is that I can jump into a Space and focus on the task at hand. If I have the mouse in hand I'll press the button for Spaces and just click on the area I want to be in. If I'm in keyboard mode I'll usually press Command-Tab and pop to the application I need, which will also switch the Space for me. I use a similar setup on my MacBook Pro, though since it is a single monitor and used primarily when I travel or am in a meeting I have it set up very differently. The principles however are the same: group applications into Spaces based on the mode of work I want to be in. As a high-tech entrepreneur I have a tendency to be running at top speed throughout the day. Over the years I have learned how to multi-task well, allowing myself to flow from one task to the other when the situation warrants it but shutting down music, alerts and external distractions when I need to focus on deep tasks. The set up I have created with Spaces works great for me and I feel considerably more productive than I did back in the old days with multiple layered windows competing for my attention. Do you juggle multiple applications at once or try to keep one application running at a time? Have a better way to keep your applications running smoothly? Please drop a note in the comments. I do it like I used to do it during my Linux years. Similar to yours, but with only four spaces (I keep it simple.) Before Leopard I used virtuedesktops which provided similar (if buggier) functionality but this has still carried over from the Linux/CDE/Motif GUI which I used for years before getting up with Mac OS X. Space 1 - Email and chat. Communications, etc just like yours. Space 2 - Web. Multiple Safari browsers with tabs there. Space 3 - Photo editing and video stuff. I do lots of photography so that's where this happens. Anything played video-wise that isn't YouTube in the browser happens here. Oh, word processing happens here too. Space 4 - Audio editing and Music, i.e. Audacity and iTunes. Since my audio editing requires (or at least it enhanced by) use of Terminal it lives in that space as well. Also I modified my Spaces trigger key to be Command-arrow since that makes for easy one-handed operation when running on the internal keyboard, and more flexibility with the external keyboard than the default CTRL-arrow combo. No dedicated mouse button for space Exposé as that is set to the standard keyboard F8 for when I need to drag the odd Finder window to a space where it's convenient to drag the file I want to attach to mail/upload with a browser. At home I'm on an HP Vista desktop, again dual screen. I must investigate this multi-desktop functionality as I never have enough screen realestate. Did it take you long to get used to working with multiple 'spaces'? @Bry: It takes a little getting used to, though I made the transition to Spaces as soon as I switched to Mac from Windows. Since I had that change going on the adjustment to Spaces was pretty minor. I don't know how I could get by without it now. I know you mentioned your setup is a Mac Pro, but I noticed the MacBook Pro also in your picture...so I couldn't help but ask: do you know of any way I can use dual monitors with a MacBook Pro? I'm now working entirely on my Mac and from my home office, and I'm missing the dual widescreens I used to have in my old office, attached to an XP box. Nice one! I seriously need to bump up my RAM beyond 2GB! Have you heard of DockSpaces? It's a free program that lets you have up to 10 different Docks. It can also be set up so that as you move between Spaces, it automatically changes to a different Dock... So you could have "Media" dock that has media-related programs and stacks in it for the spaces with iTunes and iPhoto etc. It's donation-ware and available from the link below. I had it set up for a while, but switching docks seemed to take a little too long. But I think that may have been due to my computer's lack of grunt. I'd be very interested to see how well it runs on your beast! As @Zander wrote, you should try DockSpaces. Or maybe HyperSpaces (Shareware) – which let you have totally different spaces. I Finally got my Macbook Pro – it's a wonderful machine. @Dan: you can use a Matrox TripleHead2Go Digital to split your dual-link DVI output to two single-link DVI monitors (each at 1920x1200). I've done this and it works fine. The main downside is that it treats both mointors as one giant one, so things that center (think powerpoint presentations) can be problematic. Note that you need the Triple Head2Go Digital to drive two monitors at 1920x1200. @Zander: Thanks for the link for DockSpaces. I'll check it out but I rarely use the Dock - it's more of a vehicle to see what's running than a launch tool. I'm a huge fan of LaunchBar (and before that QuickSilver and even Spotlight) for launching applications. @Josso: Congrats on the new MBP. Did you get the new model or the previous gen? @Ken: Interesting - hadn't seen that before. Thanks for the link. Spaces is one of those things I've totally left out of my working environment. I've used virtual screens before, also from Unix/Linux days. I've found that I just don't really need it. My work-at-home setup is a 24" external LCD + Lenovo laptop display (I have to work in Windows, and that's what work bought). I have enough screen space to fit what I want on, and I don't mind if windows get obscured. I can pick the one I want when I need to see it. My MacBook Pro (early 2008 version) has a similar setup, and I never need all the screen real estate for my personal use. I do make use of Expose' to switch between apps when one is obscured by another window, but Spaces is just more than I need. When I'm not using an app I tend to close it, too. It isn't like it takes a long time to start it back up. The idea of Spaces is great, but a couple of glitches are hampering its productivity for me. One is software that doesn't like Spaces. The worst offender is Office 2008. I occasionally have some problems with Adobe CS3 apps as well. I see from your setup you're not using either. The other problem I have is switching between working on a laptop by itself at home and then using it with two screens--the laptop's and an external monitor--at work. Having to rearrange all the windows when I move from home to work is a real waste of time. @kongjie: I can see where having a laptop with a monitor that is not always there would be a challenge with Spaces in it's current incarnation. I nice addition to it would be the ability for Spaces to give you as many profiles as you have monitor combinations. I also like spaces and use a setup similar to yours as I edit code in one space in Textmate and have other spaces up and running for more general tasks. I only have the built-in monitor on my Late 2008 MacBook pro 15 inch. I am going to be adding a second monitor and wonder if you see a problem in having an external monitor at a different resolution than the 1440x900 setup of the main screen. I love spaces, but would also love to see your idea of different profiles for when the Display Port is connected or when I am on the go with only one monitor. I only have a 20" iMac, but Spaces has made me enormously productive. I use one space for my regular stuff: email, word processing, etc. One for web work: Dreamweaver, Photoshop, CSSEdit and one for my VM's. Thanks to your blog I can see some possibilities for dividing up my spaces even further. One great thing I discovered is that I can drag windows from one space to the other. Firefox, for instance likes to open up in whatever space you're in which isn't always where you ultimately want or need it. I can't get Spaces to work on my dual monitor (iMac and Samsung) setup. On my laptop, all is well ... I'm no hacker but not a luddite, either. Is there some technique beyond the normal Spaces process? Not even my keyboard shortcuts work like they're supposed where Spaces is concerned. Quick update: well, Spaces seems to work but oddly. For example, if I assign two or more programs to a specific space the first program will open on the iMac; the second will then, it seems, open on the Samsung. Better than nothing, I suppose. @carl: Do the applications you are trying to open–that perform oddly–do the same thing on your multi-monitor laptop setup (assuming it's a MacBook)? It may be a function of those apps not saving and restoring their screen position and when they start they are going to your default monitor. Sorry if I wasn't clear: the MacBook Pro is not used with a separate monitor ... anyway, I keep trying Spaces and I want to like it, but I find it very quirky. Perhaps one day soon it'll simply perform correctly. I have spaces assigned to the middle mouse button - the scroll wheel press. This is probably the greatest productivity enhancement that exists in OS X. Click-click, and you are in another app in another space. I used the same trick with Expose, before Spaces existed.